Thomasina's Purrls Of Wisdom About Cats: Whisker FatigueAre Your Cats' Whiskers Feeling Overworked? Are Your Cats' Whiskers Feeling Overworked? Do cats really get whisker fatigue, Thomasina? What the heck is it??? 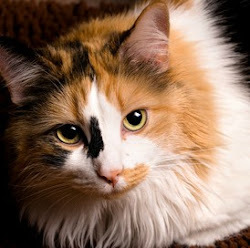 I'm so glad you asked, because whisker fatigue, or whisker stress, is so common and so few humans are even aware of it. They put their cats' food in deep, dark bowls, and then they wonder why the cats don't eat. They don't eat because the bowls make their whiskers work overtime and hurt! My human typist just had to add this: Cat whiskers are rooted in hair follicles that are filled with blood vessels and nerves. When the whiskers brush up against something, they vibrate, stimulating the nerves in the hair follicles. Ouch! No wonder deep or narrow cat food dishes cause whisker fatigue! Did you know this? Our whiskers are like built-in GPS that provides important information about our location. I thought I'd make a list of all the things our whiskers do for us. None of them cause whisker fatigue! Our whiskers are the same width as our bodies and act like little rulers that help us decide whether we can fit into narrow spaces. Whiskers also help us move around a dark room without bumping into furniture. Our whiskers sense changes in air currents, and can let us know when another animal is approaching. That's also a big help when we're... ummm... hunting (Sorry, human typist. That doesn't really work when we're "hunting" toys). The whiskers on the backs of our front paws let us know when the tiny animal we've just caught (Oh. My human typist thinks I should have said toy here) is firmly within our grasp. Those whiskers also help us feel our way when we're climbing trees. The whiskers above our eyes cause a "blink reaction" that keeps us from getting poked in the eye. If you want to know how your cat's feeling, just take a look at her whiskers. If they're sticking out sideways, she's calm and happy. If they're pushed forward, she's alert and watching something interesting. If her whiskers are flattened against her cheeks, watch out! She's scared or angry, and it's best for you to just stay away. You'd think all the work our whiskers do would cause nonstop whisker fatigue or stress. But doing the things they're meant to do doesn't make them tired. It's those food bowls that cause whisker fatigue. To be honest, I've never had whisker fatigue. But here are some ways to know if your cat has it. Your cat pulls food out of her bowl and eats it off the floor. She paces in front of her bowl but is reluctant to eat. She's aggressive with your other cats around food. She doesn't eat the food on the bottom or sides of her bowl. Imagine trying to eat when your brain is constantly getting messages that something is very nearby. Talk about information overload! 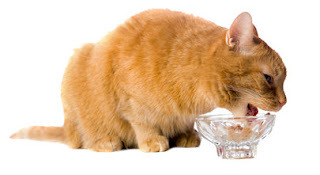 The simple way to prevent whisker fatigue or stress is to put your cat's food on a saucer or small plate. Or give her cat food bowls that are shallow and wide enough that her whiskers won't touch the sides. We like bowls that are slightly elevated, too, so we don't have to bend down so far to eat. Some of the cats in our family eat off plates, but I have really cute wide, shallow bowls with orange rims that match my orange fur. Your cat's water bowl should also be wide enough that her whiskers won't touch the sides. And please, please put it far away from her food. One more thought on whiskers: Never, trim them! They're not in your cat's way. Without her built-in navigation system, she could become stressed, scared and disoriented. Not having whiskers that are the right length can actually make some cats dizzy. I hope this answers your question about whisker fatigue, Confused Cat Mom. And if your cat has whisker fatigue, I hope you'll go out and buy her a new dish right now!